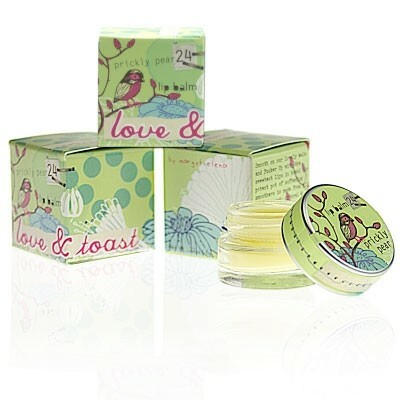 Look good & do good with Love & Toast's lip balms - made with 98% natural ingredients and paraben, dye & gluten free. Made with all things good & moisturizing, loaded with softening Organic Olive Oil, rich Organic Jojoba Seed Oil, Organic Hemp Seed Oil, rich Shea Butter, Aloe and Vitamin E… Pucker up, you'll have the softest kiss around! Packaged in a gorgeous, recyclable, printed pot with part of the proceeds going to the Regional Affiliates of Girls Inc. charity. Organic extra virgin olea europaea (olive) oil, cera alba (beeswax), organic simmondsia chinensis (jojoba) seed oil, butyrospermum parkii (shea butter), theobroma cacao (cocoa) seed butter, aroma, organic cannabis sativa (hemp) seed oil, aloe barbadensis leaf extract & canola oil, tocopheryl (vitamin E acetate), stevia rebaudiana bertoni leaf extract, d-Limonene, Linalool, Geraniol, Citral. I absolutely love this lip balm!. The packaging is gorgeous with cardboard box outer packaging with beautiful bird design! When you open the lid you see a small heart shaped cut-out. On the next flap there is a toast shaped hole and then inside nestles a beautifully made glass jar with a metal lid. The jar is heavyweight so not ideal for travel but it looks gorgeous on your dressing table! This is not a readily available range in the UK but if you can get hold of it its delightful!. There are simply too many gorgeous irresistible products in this range so beware! The balm inside has no artificial colours or flavours and is a thick slightly yellow colour. It has ingredients of organic olive oil, Jojoba seed oil, hemp seed oil, shea butter, aloe and Vitamin E. You only need a small amount on your fingertip for an application and the balm melts beautifully into the lips leaving a subtle sheen but no greasy residue at all. The fragrance and flavour of this balm is a fabulous sweet but tart pear which makes your mouth water whenever it is applied to the lips. The balm applies beautifully to the lips and leaves them soft, supple with a delicate sheen. The effects are long lasting without the need for re-application. The pot is big and lasts for such a long time. This product is so addictive it is my absolute favourite of the range and I will certainly be re-purchasing again! "I absolutely love this lip balm!. The packaging is gorgeous with cardboard box outer packaging with beautiful bird design! When you open the lid you..."